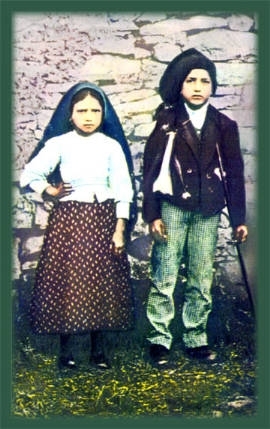 Blessed Jacinta and Francisco Marto of Fatima, we ask for your intercession. Please help us to attain the fulfillment of Our Lady of Fatima’s requests and: 1) the release of the full, authentic Third Secret of Fatima. 2) the bringing about of the triumph of the Immaculate Heart of Mary. The “tragic human lust for power and evil” has not ended! Fatima does not “belong to the past”! Only 16 months later, the world witnessed the bloodiest terrorist attack in history on September 11, 2001 in New York City. In the aftermath of this attack, we have also witnessed ever-increasing violence in the Middle East and many other parts of the world. The world is clearly tottering on the brink of civil unrest on a vast scale, and perhaps even a world war. In view of these realities, Msgr. Bertone’s statement that the era of the “lust for power and evil” has been brought “to an end” is nothing short of ridiculous. 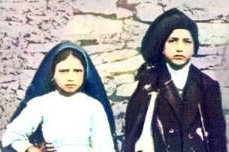 Now, more than ever, the world needs to know the full contents of the Third Secret of Fatima. Yet there is a mountain of evidence that a text which pertains to the Secret — a text which explains the vision of the “bishop in white” — is still being concealed. This text almost certainly contains the words Our Lady spoke following the incomplete sentence in Sister Lucia’s Fourth Memoir: “In Portugal, the dogma of the Faith will always be preserved etc.” What did Sister Lucia indicate when she wrote “etc.”? Clearly, she was indicating the rest of the words that Our Lady spoke in the Third Secret. 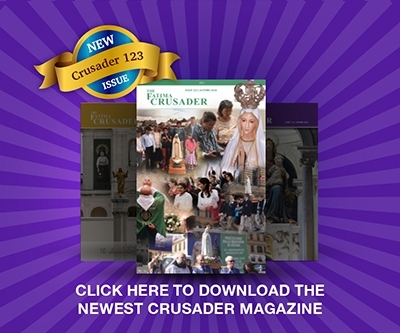 To learn about the massive evidence that the Third Secret has been covered up by certain members of the Vatican apparatus, write or call us for a free copy of the booklet “Chronology of a Cover-up”. We know that the Third Secret must include words of Our Lady not found in the published vision, and that these words end with the hope-filled phrase: “In the end, My Immaculate Heart will triumph. The Holy Father will consecrate Russia to Me, which will be converted, and a period of peace will be granted to the world.” She asks all Her children to help Her accomplish this.